Politics In the Office Survey: 94% Are Talking Politics at Work; Unlike Candidates, Keeping it Civil | Challenger, Gray & Christmas, Inc.
With the presidential election still months away, the current political landscape has no doubt given cause for workers across the country to discuss and debate the presidential candidates’ positions or antics. In fact, a new survey released Tuesday from outplacement and executive coaching firm Challenger, Gray & Christmas, found 94 percent of respondents have witnessed political discussions in the workplace, with 18.2 percent reporting that those discussion happen often. The survey of 150 human resources executives in March also found that 91 percent participate in political discussions themselves, although 45 percent report those discussions rarely occur. Despite the cantankerous rhetoric this year’s crop of political candidates have displayed on televised debates and at their rallies, workplace discussions on the topic remain civil, with 63.6 percent of human resource executives describing the interactions as mostly congenial and respectful. The remaining 36.4 percent define the political discussions they have witnessed as passionate, but still respectful. Zero human resources executives reported heated or disrespectful workplace debates, unlike among the presidential candidates themselves. Companies are also entering the fray of political positions, a phenomenon that found the spotlight during the 2010 midterm election. 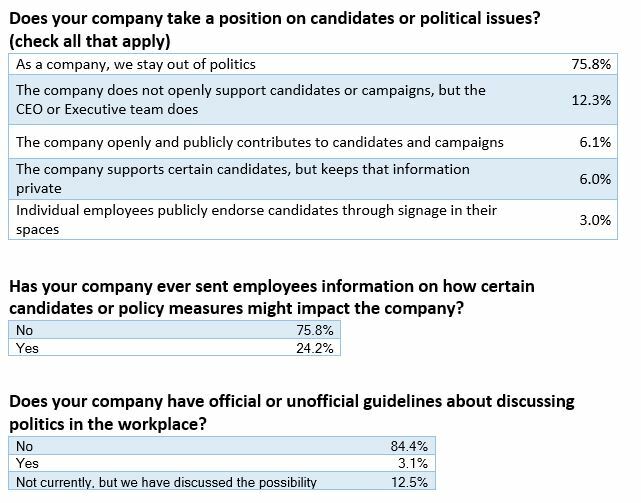 Almost 25 percent of respondents reported their companies have sent information to employees on certain candidates and how their policy measures may impact the company. Six percent of companies openly contribute to political campaigns, and another six percent privately support candidates. In 12 percent of cases, while the company does not support campaigns publicly, the CEO or executive team does. 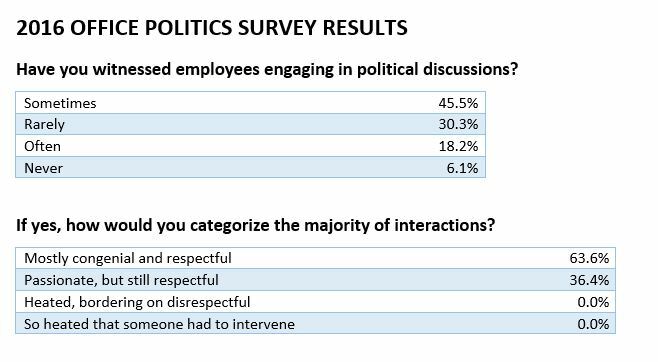 With all this potentially confrontational discourse occurring at the office, only 3 percent of companies have formal policies for discussing politics at work, and another 13 percent have discussed the possibility of implementing guidelines. “While political talk in the office should not be discouraged, it is important that management not discriminate due to their workers’ political leanings,” cautioned Challenger. “Political debates in the workplace not only can present a possible disruption of productivity, but they can create a tension-filled work environment. In extreme cases, these debates can even become hostile. For co-workers who discover that they disagree on a hot-button issue like defense spending, women’s health, and health care plans, which have been thoroughly debated in the media, it can be difficult to set aside these differences when it comes time to coordinate on a project,” said Challenger. “The situation can be particularly uncomfortable if the political rift is between a worker and his or her supervisor. It is important to remain well-liked by your supervisor, so sharing political views with the boss can be a risky venture,” said Challenger. “Our survey found 84 percent of companies do not have a formal policy about political discussions in the workplace. However, especially with bullying and incivility becoming an issue in the workplace, department heads and managers should be mindful of political discussions in an election year and tapped into the office environment” said Challenger. “For the most part, employees have to monitor their own behavior. One of the keys to political discussions at the office is to keep them brief and light. The last thing you want is for conversation to become confrontational. Keep it civil: Do not let friendly banter deteriorate into a name-calling shouting match. Know your colleague: Career-wise, it is probably safer to converse with those who share your views. If unsure about a colleague’s views, then avoid political conversations or carefully probe for his or her views. If you must talk politics, stick to politics: While politics are increasingly entwined with religion, consider that aspect of the debate off limits and avoid personal attacks.